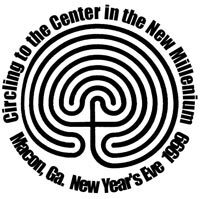 For celebration of the coming of the Millennium, First Night Macon sponsored a labyrinth walk. A group met at noon on New Year's Eve Day and constructed a classical seven-circuit labyrinth from three tons of granite stone. 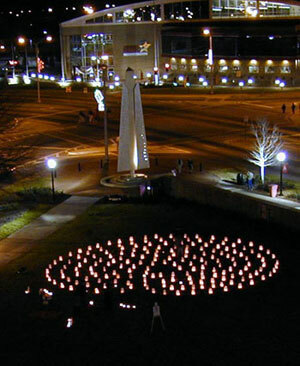 That evening we illuminated it with luminaries. People were invited to come and celebrate by walking the labyrinth as a centering and spiritual way of entering the new Millennium. Walkers were offered the opportunity of making a New Year's resolution or wish. They were given "Burning Sticks" (wooden Popsicle sticks) on which to write their resolution or wish. The sticks were carried into the labyrinth as the walkers meditated on their intentions. Upon leaving the labyrinth, the "Burning Sticks" were dropped into a special pottery "Burning Bowl" to ceremonially release the energy to the universe. All who walked were given a commemorative sticker to wear.Over 350 people (adults and children) participated in the Millennial New Year's Eve Labyrinth Walk. See the ghost of the labyrinth.